Singapore is a melting pot of cultures and religions and as a result there are some truly unique flavors to whet your palate. Known throughout the world as a foodie capital, the Little Red Dot has foods for all kinds, from expensive Michelin-starred restaurants to scrumptious street food. You’ll find influences of Malay, Chinese, Indian, Indonesian, and the uniquely Singaporean Peranakan. The list below will share our 5 favourite Singaporean dishes from first hand experience. Get your tummies ready and your taste buds tingling as we share our top 5 great foods to try in Singapore. 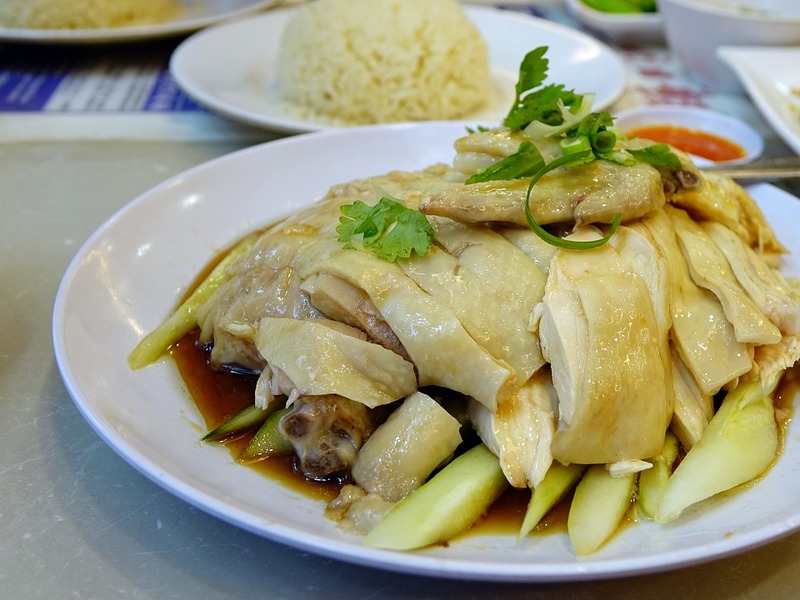 First on any list of the best foods to try in Singapore has to be the ubiquitous, simple and flavorful Hainanese Chicken Rice. So what makes this Singaporean national dish so popular? It’s all in the broth. The chicken is soaked in boiling pork and chicken bone stock so that it absorbs all the flavor. The fowl is then chopped and placed on a bed of aromatic rice boiled with chicken stock, ginger and garlic. Some stalls chuck the cooked bird in ice so that it gains a jelly-like seal, while others roast it to create ‘black chicken’. 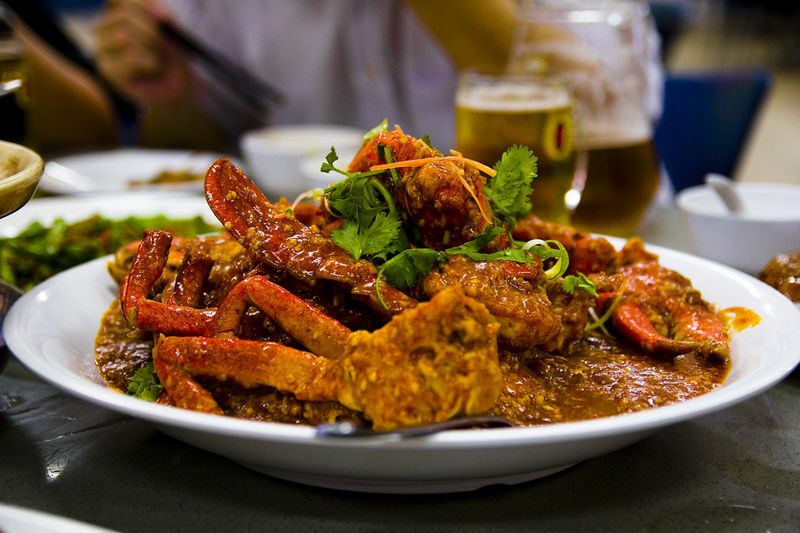 Another internationally famous Singaporean food to try is Chilli Crab. There are usually two different styles of cooking the hard-shelled crab – either with a tomato base or a black pepper sauce. Chilli Crab is made by steaming the crustacean and then cracking them partially before placing them into the chosen sauce after which it’s stir fried to perfection. Even though chilli is used, you’ll find that Chilli Crab is actually quite mild. It does come with bread (fried mantous buns) that should be dipped in the sauce and make for a delicious combination. What do you get when Chinese cuisine meets Malay fare? The most delicious coconut broth you’ve ever tasted! Laksa is a spicy coconut curry dish that is usually served with shrimp, fish cakes, egg, chicken and vermicelli. What makes the Singaporean version of Laksa stand out is that it’s a curry laksa that it is truly Peranakan. It’s made with cut-up noodles, cockles (a kind of mollusc), fish slices, shrimp and tau pok (beancurd puffs) called Katong Laksa. 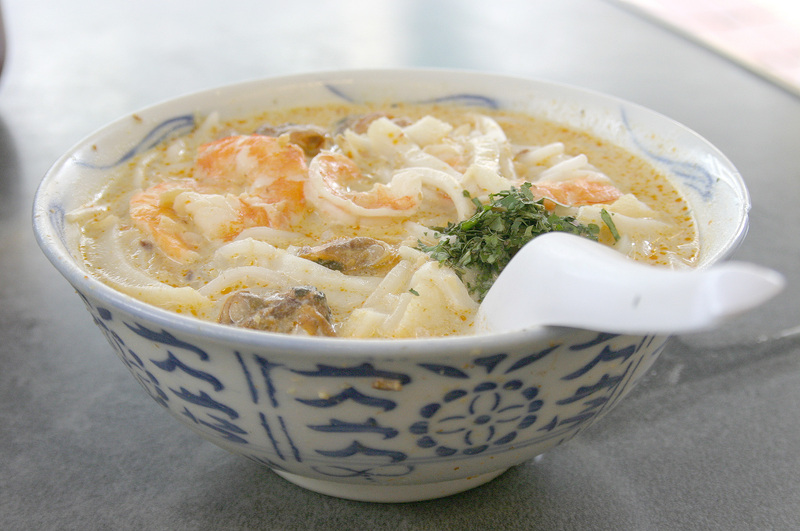 Here’s a local tip: This laksa variant should only be eaten with a spoon. 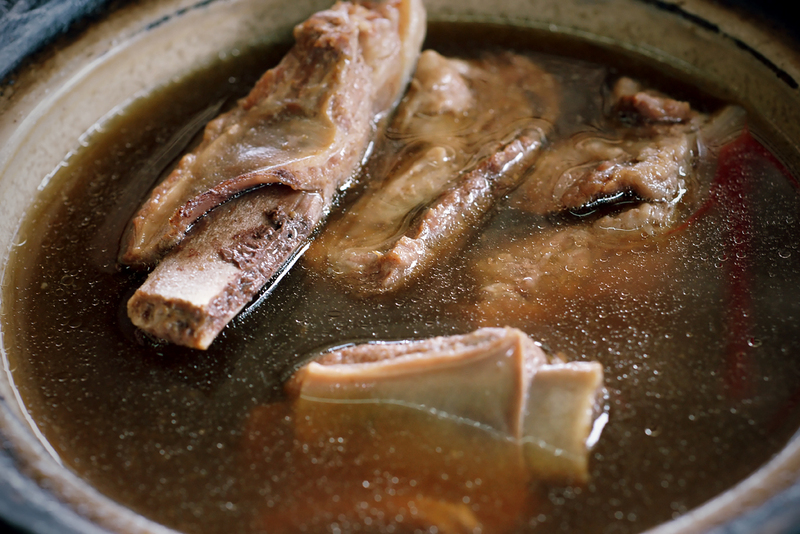 Bak Kut Teh is a Singaporean dish that has been around since World War II. It is a simple meal that reinvigorates in the often humid tropical heat of the country. Contrary to what the name suggests, this item is in fact not tea, but rather resembles tea in color and consistency. It’s actually a pork rib dish cooked for many hours in a broth of herbs and spices that may include star anise, cinnamon, cloves, dang gui (Chinese Angelica Root), fennel seeds and garlic. There are three different variants from the Teochew style which is lighter, using more pepper and garlic; to Hokkien which is darker due to the soy sauce; and Cantonese, with more medicinal herbs thrown into the pot. The origin of this dish is steeped in legend. Some say it was created as a tonic to aid the Chinese coolies working in Clark Quay and others mention that it was mixed together by a roadside pork noodle store owner for a beggar. Whatever the origins, the result is a delicious Singaporean dish that will satisfy the stomach and fuel you with energy. 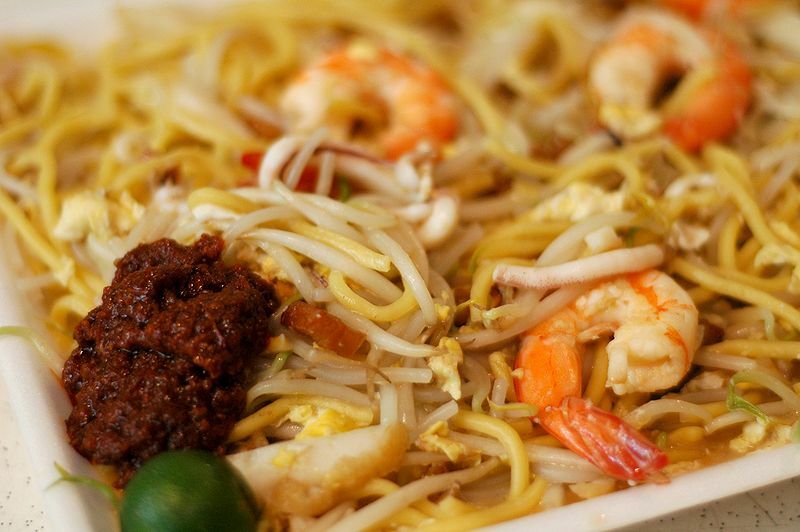 While the name of this mouthwatering Hokkien noodle dish suggests that only prawns are used, the Singaporean variant also has slices of chicken, squid, pork or fish cakes. Prawn is the predominant flavor though, where you will taste the crustacean in the thick stock. The Singaporean version also blends two types of noodles, rice and egg, that creates a wonderful texture in the rich stock. The origin of this unique noodle blend came from a time when post-war Hokkien noodle factory workers would meet up along Rochor Road and fry any excess noodles together. For some truly Singaporean meals, check out our article on the best Singaporean restaurants in Singapore here. You can also visit the Peranakan Museum for more information about this unique culture or visit Penang or Malacca in Malaysia for authentic Peranakan bites. Copyright ©2019 Singapore n Beyond unless otherwise noted.